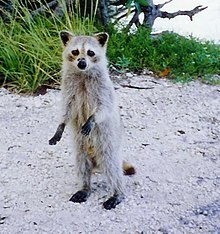 In the first decades after its discovery by the members of the expedition of Christopher Columbus, who was the first person to leave a written record about the species, taxonomists thought the raccoon was related to many different species, including dogs, cats, badgers and particularly bears. 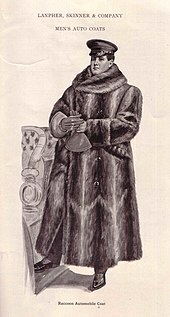 Carl Linnaeus, the father of modern taxonomy, placed the raccoon in the genus Ursus, first as Ursus cauda elongata ("long-tailed bear") in the second edition of his Systema Naturae (1740), then as Ursus Lotor ("washer bear") in the tenth edition (1758–59). 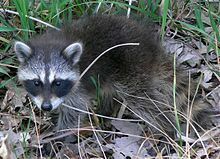 In 1780, Gottlieb Conrad Christian Storr placed the raccoon in its own genus Procyon, which can be translated as either "before the dog" or "doglike". 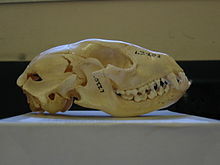 It is also possible that Storr had its nocturnal lifestyle in mind and chose the star Procyon as eponym for the species. ^ Timm, R.; Cuarón, A.D.; Reid, F.; Helgen, K.; González-Maya, J.F. (2016). 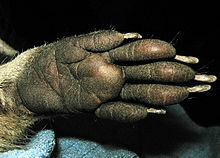 "Procyon lotor". IUCN Red List of Threatened Species. 2016: e.T41686A45216638. doi:10.2305/IUCN.UK.2016-1.RLTS.T41686A45216638.en. Retrieved 24 November 2016. ^ Seidl, Jennifer; McMordie, W. (1982). Fowler, F.G.; Fowler, H.W. ; Sykes, John Bradbury, eds. The Concise Oxford Dictionary of Current English. Oxford: Clarendon Press. p. 851. ISBN 978-0-19-195872-4. 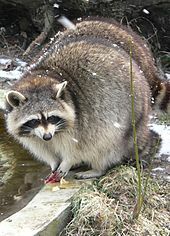 ^ "Animal Facts: Raccoon". Canadian Geographic. 2016-04-04. ^ Wozencraft, W.C. (2005). "Order Carnivora". In Wilson, D.E. ; Reeder, D.M. Mammal Species of the World: A Taxonomic and Geographic Reference (3rd ed.). Johns Hopkins University Press. p. 627–628. ISBN 978-0-8018-8221-0. OCLC 62265494. ^ Wozencraft, W.C. (2005). "Order Carnivora". In Wilson, D.E. ; Reeder, D.M. Mammal Species of the World: A Taxonomic and Geographic Reference (3rd ed.). Johns Hopkins University Press. p. 628. ISBN 978-0-8018-8221-0. OCLC 62265494. ^ Helgen, Kristofer M.; Wilson, Don E. (2005). 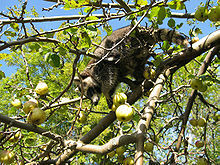 "A Systematic and Zoogeographic Overview of the Raccoons of Mexico and Central America". In Sánchez-Cordero, Víctor; Medellín, Rodrigo A. Contribuciones mastozoológicas en homenaje a Bernardo Villa. Mexico City: Instituto de Ecología of the Universidad Nacional Autónoma de México. p. 230. ISBN 978-970-32-2603-0. Retrieved December 7, 2008. ^ "Bald Eagle". Birds of North America Online. Cornell Lab of Ornithology. Retrieved 2012-06-27. ^ Goldman, Jason G. (30 May 2017). "How a Kids' Cartoon Created a Real-Life Invasive Army". Nautilus (science magazine). Retrieved 31 May 2017. ^ Aldred, Jessica (2016-08-02). "Raccoon, mongoose and cabbage among invasive species banned from UK". The Guardian. ^ Joline Gutierrez Krueger (2 July 2014). 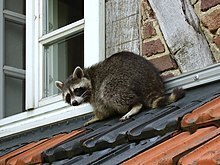 "Rascally Raccoons wreak havoc across Duke City". Albuquerque Journal. Retrieved 21 March 2016. 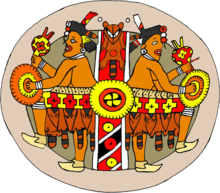 ^ "Trichinellosis: Trichinellosis Information for Hunters". CDC. 2017-07-28. 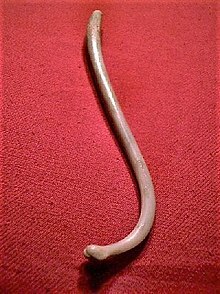 ^ Palomino, J. (2015-10-31). 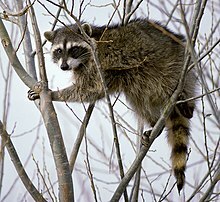 "Pack of raccoons attacks a couple in the Richmond District". San Francisco Chronicle. Retrieved 2015-11-01. ^ LeBlanc, Pamela (December 13, 2008). "Pictographs, petroglyphs on rocks record beliefs of earliest Texans". American Statesman. Archived from the original on March 21, 2009. Retrieved 2009-01-29. ^ "L&M Highland Outfitters". Retrieved 2017-02-12.